xo: meetings are journeys, welcome on board! relaxocean welcomes you aboard a sailing boat, may be docked in a marina, anchored in a lagoon for a day, or a night or even several. Life on board is communal! In spirit and budget of backpacker's hostels, you are warmly invited to share space and soul of boat with other travellers. There is a shared kitchenette with catered option. The boat: Ding-Dingue is a nine metre long Super Arlequin sailing boat. She has a monohull and sleeps up to six people in one double front cabin, one aft single berth and the central sitting area which turns into two narrow bunks or a triple bed. She also as a kitchnette and toilets. Ding-Dingue began sailing in 1977, completed a world tour between 1978 and 1983 and crossed the Atlantic ocean for a second time in 2012. Her story is told through her rustic charm. She is equiped with all the necessary gear to have fun in the surf including a kayak, fishing tackle, snorkels and a slackline to be streched between palm trees. Suggested donation per person per night: 10€. lime in which rhum ? 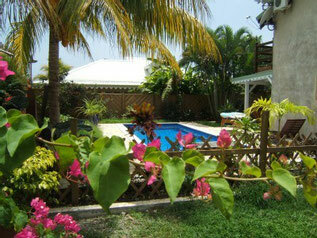 Small structure of six up-to-date and welcoming cottages with swimming pool, disabled acces. Between Sainte Anne and Saint François. relaxocean is also member of worldwide travel and shared hosting couchsurfing.org.